On October 30, 2017, Jerry C. von Sternberg, Esq. and Dr. Glen Stevick spoke at the Union Internationale des Avocats’ (an international litigation society) annual Congress in Toronto, Canada. Christopher B. Kende of Cozen O’Conner, New York, was the moderator and John B. Pinney of Graydon, Cincinnati also spoke on the panel. 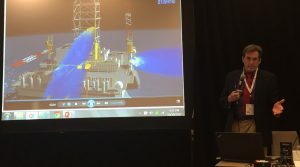 The panel discussion focused on demonstrative “evidence” and allowed the panel to explain in detail (with the backdrop of the DEEPWATER HORIZON tragedy and trial) of the use of computer generated animations and accident recreations and the ability of counsel to have their words literally come to life on the screen in front of judges and juries. Dr. Stevick’s subsequent paper on drill pipe buckling and the ability of a BOP to close a well in a blowout situation is linked below.